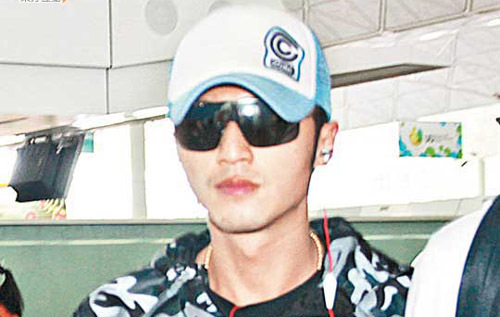 Nicholas Tse (謝霆鋒) and Cecilia Cheung (張栢芝) spent four hours alone while celebrating Lucas’ birthday at home. Currently, Nicholas will put aside his family matters to focus on work. Arriving at the airport at 9:30 AM yesterday, Nicholas wore sunglasses and appeared extremely cool. Reporters rushed forth and asked a series of questions. “Is there a chance in reconciling with Cecilia Cheung? Does Cecilia want custody of the children instead of alimony? Was Lucas happy in receiving his birthday gift?” Nicholas maintained a “chok-like” silence and did not respond to any questions. Nicholas’ assistant replied, “We will not discuss these issues today.” Accompanied by his assistant and hairstylist, Ricky, Nicholas entered the gates at the airport. It was understood that Nicholas flew to Shanghai to film a commercial yesterday. He will go to Jiangsu Province in China next. The following week, Nicholas will fly to Beijing to film mainland drama, The Next Miracle <下一個奇迹>. He will not return to Hong Kong until the end of October. It will be two months before Nicholas will be able to see his sons, Lucas and Quintus, again. No wonder his expression appeared so cool! Jayne: It sounds as if Nicholas and Cecilia will not see each other for another two months, which is a long separation period. With so much time apart, the pair will be forced to heal their wounds on their own. Whether by choice or not, circumstances will force Nicholas and Cecilia to grow emotionally apart. The circumstances seem to be against them and not allowing for time to even discuss the marital situation thoroughly. Hope that they can try to work out their differences! Wish em all the luck! This has gone on for far too long and these two children are playing the media for all it’s worth to get as much publicity as they can………who the hell cares anymore? Even if they don’t divorce now, it will happen eventually. These two are just not a good match…..
Nic and Ceci’s strenuous and long working hours makes it seem like their marriage is pointless sometimes. Both are always off filming, leaving their children in the care of someone else. As much as I still wish them to be back together, with them almost never seeing each other makes it difficult for a marriage to last. Hope Nic doesn’t block Ceci from calling or texting him since communication is very important for the two now. I think that is why if both people are from the circle, the woman(sometimes the guy does for awhile too) usually has to give up her career or change into a different one in order to take care of the kids. However, if the wife stays home and the husband works and is rarely home, the couple can easily grow apart which may result in a marriage ending. I think that may be one of the reasons why some women don’t want to marry a guy from the circle. The life of a star, not everyone can understand and accept it. Allegedly, Cecilia used her kids to force Nicholas meeting alone with her at home. It sounds like Ceci is used a same tactics to force Nic something again. I do think Nic made a right decision to divorce Ceci. I don’t think Nicholas and Cecilia are getting back together. On August 1, Nicholas and Cecilia with their lawyers had a meeting up to 10 hours so I am sure both parties came to a reasonable agreement for both sides already. Therefore, there shouldn’t be any other issue on August 2 when Nicholas head over to celebrate Lucas’ birthday at Cecilia’s place. Both are very independent and workaholic people. Both of them really love their jobs in the entertainment industry. There was no way that their marriage would’ve lasted. I predicted from the beginning that their marriage wouldn’t last. It’s a bummer since they have so much history together. That’s true. Maybe that’s why so many artists don’t get married until much later on in their life. As long as both parties came to a good agreement then I really do wish them both the best. Who knows, maybe in the future they might find themselves back together again. Looks like EEG is not keen to have Nicholas remain married. EEG wants Nicholas to divorce. Look at the plans they have laid for Nicholas, ridiculous!!!! 2 months not seeing your family is too much for a married man to bear. It is part of the strategy to control Nicholas ( if he is that stupid to realise or too conscious of his own image ) and a good plan to make Nicholas slot to hell for EEG with no regards to his personal life and family. So despicable and irresponsible boss!!!! Looks like Nic suffering asthma attack in Beijing, filming a new movie. That guy is overwork. A voodoo curse at Nic? Will it feel better just to sign the divorce papers to be over with it? Not only overwork. Over stress too.